Frank Schildiner reads from Thunder Jim Wade and Tales of the Shadowmen at PulpFest 2014. 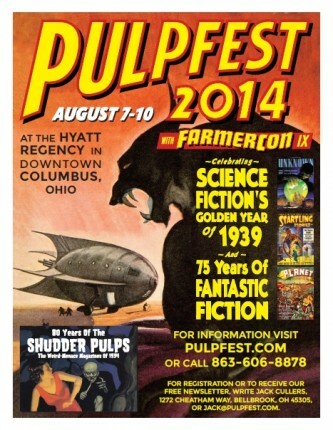 The New Pulp Panel from PulpFest 2014. Moderated by Ron Fortier and featuring Ralph Angelo Jr., Jim Beard, Wayne Reinagel, Frank Schildiner and Art Sippo. Christopher Paul Carey reads from the upcoming “Hadon, King of Opar” available in 2015 from Meteor House Press. “The Blood of Ancient Opar” to follow. In celebration of The Avenger’s Diamond Jubilee, Rick Lai provides a comprehensive history of the legendary pulp hero. In this weeks episode I will be delivering my PulpFest 2014/FarmerCon IX convention report, as well as discussing the purchases I made. 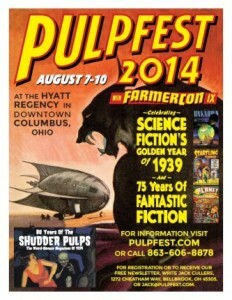 Due to getting ready for PulpFest this weekend, there will be no episode of Pulp Crazy this week. However, I will be there recording panels and maybe even doing some interviews to post when I get back. I’ll have a full convention report. It’s always a fun time.